Our next trial with the Specialized Saddle (15" Trailmaster with English rigging) was to place thick wedge shims at the back of the saddle and thinner wedge shims at the front of the saddle. The we did several test rides using the same shim set up. 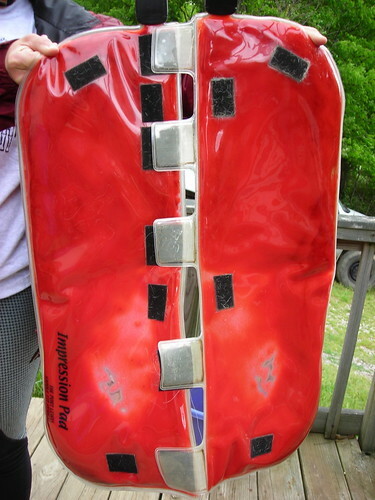 All the pictures from this blog entry have the shims set up like the following picture. Our first test was a short walk/trot uphill/downhill test with the Port Lewis Impression Pad (PLIP). The next two pictures show the PLIP after that ride. Still seeing bare spots through the shoulders. Our next test was a 15 - 20 minute ride that included uphill/downhill/flat and walk/trot/canter. 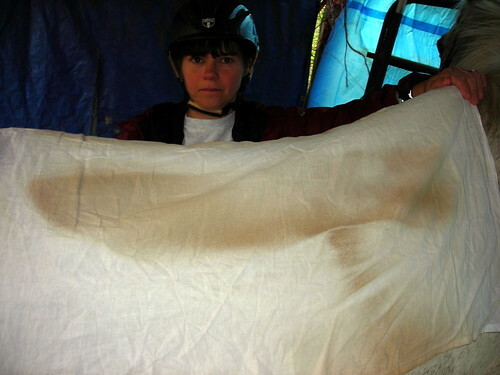 This time we used a flour sack cloth under the neoprene pads. The following pictures are from that test. We turned the cloth upside down for pictures so the dirt pattern on the left side is actually from the ride side of Tanna and vice versa. The next day, I did a test. 9.5 miles in 90 minutes. Walk/trot/canter. Mostly flat terrain. A typical training ride from the house. 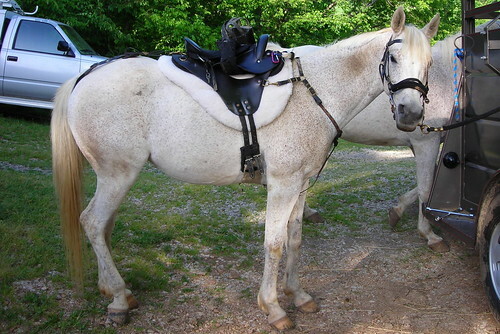 I saddled him up with a woolback oversized round barrel pad (aka an endurance pad). 22" mohair string girth. The next pictures come from that ride. This picture shows him saddled and ready to go. You can see where the girth comes to on him. 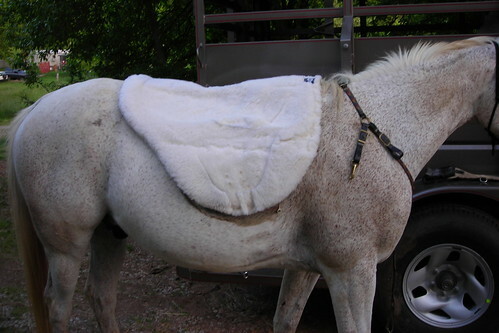 The woolback pad after the ride. You can see the imprint of the billets and the connection of the billets to the flap. 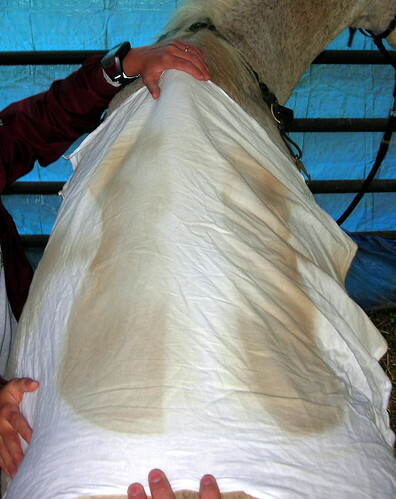 This is the sweat pattern on the loins after the ride. It's different. I don't know which one is better or if they're both bad. Here's another view with more of the back shown. Still not sure about the shoulder set up and the differences in the sweat pattern in the loins seems to indicate something is out of whack there, too. 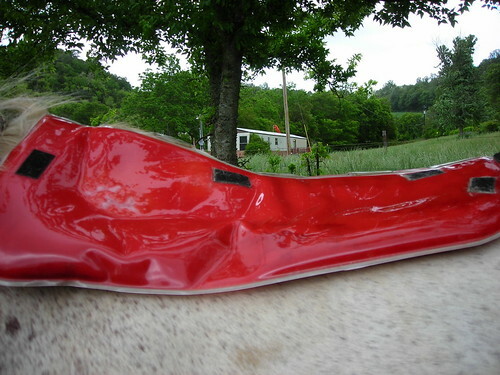 trust me, i feel your pain :) I dont use the PLIP and fortunately we had some "on hands" help with our specialized but since the horse changes.. it's a continuing challenge. If there is one thing I really, really hate, it's new tack, especially a saddle. You think your problems will be solved, but a bunch of new ones pop up. 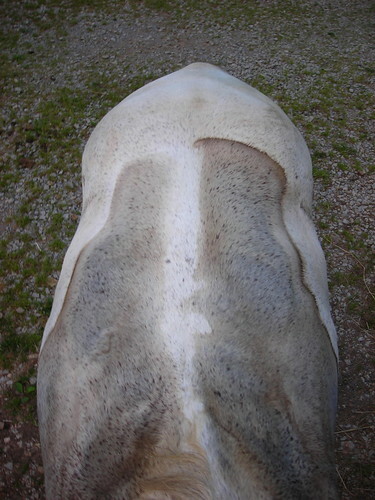 I have a hunch that the difference in the loin sweat pattern is caused by the rider, not the saddle. Maybe? 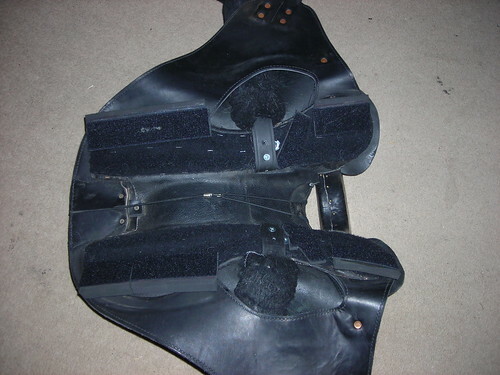 Riding in a new saddle could be affecting you as well as the horse. I use the same saddle as your old one. I have started having good luck with it (after lots of trouble) in combination with Len Brown's CorrecTor pad. 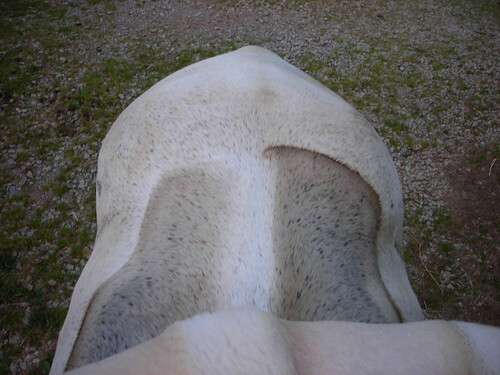 There is a lot to read about saddling on the CorrecTor web site, some of it helpful.